In Finland the nalbound mittens have traditionally been started at the top, and the top has been made square shaped. It is possible, however, to make the mittens also cuff up. Video (link) and outline-patterns (link). 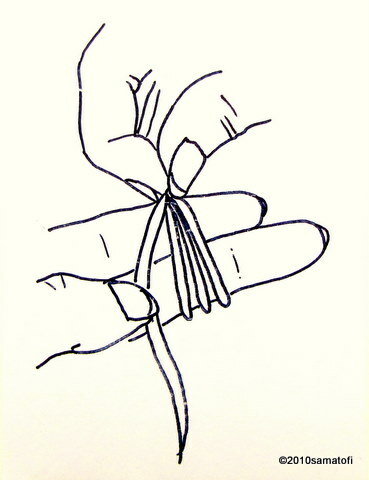 In those methods which give only one thumb loop to start with, you can make more thumb loops by leaving the old thumb loop around the thumb during the next one or two stitches. You will easier get a pair of symmetric mittens or socks when you make both mittens (or socks) at the same time, for example a couple of rows at a time, or one lenght of yarn at a time. Count the stitches in both foundation rows (the first chain of stitches), to make sure your pair will be of same size. In thin yarns a difference of a stitch or two will not really show, but in a thicker yarn you will see and feel the difference if one item has more loops than its pair. When you are making nalbound mittens from cuff up, you'll first need to make a chain of stitches, or a foundation row, the length of which depends on the size of the mitten and the shape of the cuff. Leave a yarn tail of about 30-50 cm long. You'll need this tail later when you are finishing off the edge. If the tail is bothering you, you can use a small hair clip to lock the tail at the edge. The cuff part can be straight (about equally wide all through), a bit widening (mitten is wedge-shaped or A-shaped), or bell-shaped (widening more strongly). Nalbound fabrics tend rather to stretch lengtwise and narrow widewise in use, which is good to keep in mind when you are estimating the width and length of your mittens. A mitten with a straight cuff is easy to start. Make the foundation row long enough to fit nicely around the widest part of your hand (thumb root). You can use a measurement tape or simply try the foundation row around your hand. To make a mitten with a wedge-shaped (A-shaped) cuff or a bell-shaped cuff, similarly make the foundation row long enough. You can use an outline-pattern sketched on a paper, or an old mitten, to compare with your work. A wedge-shaped cuff needs to be decreased gradually at both sides of the mitten, for example one stitch at both sides in every row. The number of stitches-to-be-decreased depends on your yarn thickness. With thin yarn you may have 4 stitches per 1 cm, while with thin yarn there may be only 2 stitches per 1 cm, so when working with thin yarn, you'll need to decrease more. An outline-pattern can be used as a tool for estimating the decreases. A bell-shaped cuff is decreased in a similar way, but often there is a narrower part between cuff and thumb, so you'll need to increase again before getting close to the thumb. Keep on nalbinding till the thumb web. The opening forms when you leave the new stitches unconnected to the previous row (compare to making the first chain of stitches). At the other end of the opening the stitches are again connected to the previous row. Before connecting the chain of stitches to the previous row again, check the width of the mitten. Quite probably you can make the mitten a bit narrower at this point because the widest part needs to be below the thumb opening. The narrowing happens easily, if you leave the chain of stitches e.g. 2-3 stitches shorter than the previous row below is, that is, there will be less stitches on the upper side (finger side) of the thumb opening than at the bottom side (cuff side). The 'shortening' depends on the yarn thickness, and how wide your mitten bottom part is. After connecting the chain of stitches to the previous row again, the chain of stitches will be a bit tighter than the bottom of the mitten. Video (link). When you are finishing off the edge, you can first start by pulling the stitches smaller, and at the same time gradually pick up less loops behind the thumb, and the ones you have around the thumb (if you have more than one). If you have tensioned the new stitches around your thumb, you can pull them smaller by tensioning them around the thumb nail/tip. When the stitches become so small the thumb loop does not fit around your thumb anymore, you can insert the needle through the stitches without thumb loop(s) (flat). Do a couple of those smaller stitches. iian lyhyen tai liian pitkän sormiosan korjaat nopeiten, kun leikkaat saksilla kintaan kärjen poikki, ja joko teet muutaman lisäkerroksen tai alat kaventaa aikaisemmin. Leikkauskohdasta nypitään irtonaiset langanpätkät pois ja etsitään viimeinen ehjä silmukka. Jos lankaa ei ole yhtään ylimääräistä, leikkaamisen sijasta kintaankärki kannattaa purkaa silmukka kerrallaan ja käyttää kaikki langanpätkät uudelleen. If you are not sure whether you have enough yarn for your mitten project, make the mittes top down, do both mittens simultaneously, leave the thumb opening, do a couple of more rows, and then do the thumb. Divide the remaining yarn onto two balls, one ball for each mitten, and then do the thumb-cuff part as last. If you happen to run out of yarn, that will happen on the same place on both mittens, and you can use some other colour at the cuffs.